Explanation: Have you seen the passing planets yet? 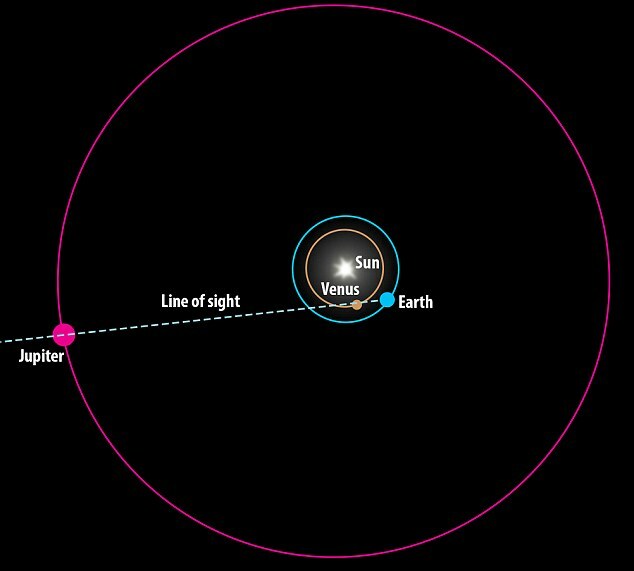 Today the planets Jupiter and Venus pass within half a degree of each other as seen from Earth. This conjunction, visible all over the world, is quite easy to see -- just look to the west shortly after sunset. The brightest objects visible above the horizon will be Venus and Jupiter, with Venus being the brighter of the two. Featured above, the closing planets were captured two nights ago in a sunset sky graced also by high-level noctilucent clouds. In the foreground, the astrophotographer's sister takes in the vista from a bank of the Sec Reservoir in the Czech Republic. She reported this as the first time she has seen noctilucent clouds. Jupiter and Venus will appear even closer together tonight and will continue to be visible in the same part of the sky until mid-August. That's a lovely image and a beautiful composition. I really like it! "Venus and [Jupiter] are alright tonight!" As usual, the Horkhiemer effect is playing a key role here in Florida. That is to say, clear sky's until dusk, then overcast until midnight. I'll have to wait until they get this close next time. Here in southern Australia the El Nino is providing us with a cool clear winter. The cloudless dusk and night sky have provided stunning clarity for this event. Well done on a fantastic photo. Also I haven't had the pleasure of seeing noctilucent clouds yet. I think the brightest visible object is giving Kate a shadow. Nice compositions sure have to have everything happen to show up at the right time as in today's APOD. Hope we get to see more like this in the submissions. Thanks Petr!